A quick update because a couple of interesting things have come to light over the past few days. First, a report from Quint at Ain’t It Cool News reveals that Breaking Bad’s Aaron Paul has taken a few meetings regarding the possibility that he might play Eddie Dean in Ron Howard’s adaptation of The Dark Tower. 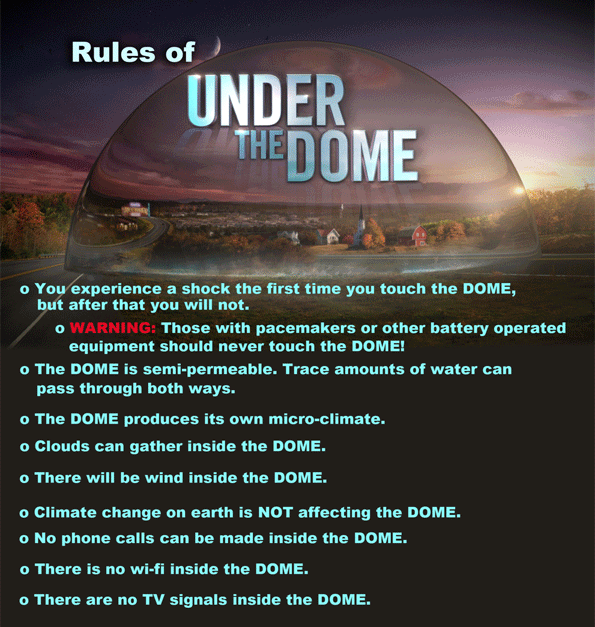 Under the Dome will return on June 30, with an episode written by King. In a trailer for Season 2 that debuted at the Television Critics Association winter press tour, viewers see that two favorite characters won’t survive the first episode and there will be an unexpected kiss. King’s three year-end best-of essays appeared in the same double issue (Issue 1291/1292 dated 12/27/13 and 1/3/14) of Entertainment Weekly at the end of December. Since the essays won’t be on EW’s website, they were posted at King’s message board. Look for my review of the first episode some time next week. In a nutshell: It’s good! 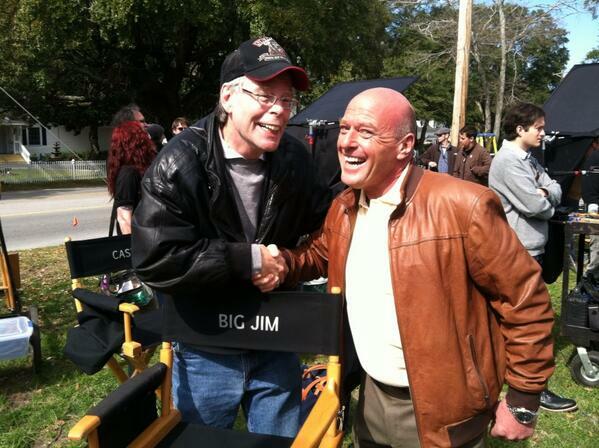 The official Stephen King Facebook page debuted today. Be sure to click on the banner when you get there to see a clever mosaic. Once upon a time, not so terribly long ago, I pretended to be Scarecrow Joe as part of the promotion leading up to the hardcover release of Under the Dome. I wrote the kid’s blog entries and ran his twitter feed. Colin Ford (We Bought a Zoo) will play him in the CBS TV series that debuts on June 24th. That’s the first casting news to be announced. There’ll be a promotional ad for the series during the Super Bowl. Neal Baer serves as showrunner. DreamWorks’ Stacey Snider is executive producing with Spielberg, King, Baer, Brian K. Vaughan (who wrote the pilot), Justin Falvey and Darryl Frank. Here’s an interview with King and Vaughan about the adaptation. Filming starts in Wilmington, NC in February. The thirteenth and final episode will reveal a vital piece of information about the town’s situation, but will be open-ended, the hope being that the series will be renewed and there will be more adventures in Chester’s Mill. The third season of Haven ended with a series of bangs last night as the final two episodes were aired. What a cliffhanger it was, too. We learned some new information (who’s the Colorado Kid’s father? Who’s in charge of the guard?) but now we have to wait months and months to find out what will become of Audrey and Nathan and company. Turning Duke into a teenager, albeit briefly, was a stroke of brilliance. The signed, limited edition of The Shining from Subterranean Press will go on sale at approximately 12:00 PM, EST, on Wednesday, January 23. The artist for this edition is Gabriel Rodriguez (of the comic series Locke & Key). There’s a three page interview with King in the January 11 issue of Entertainment Weekly about Doctor Sleep. “6 Books We Can’t Wait For — Stephen King on His Shining Sequel” I haven’t found it online yet, though. PS Publishing is going to do two 30th anniversary editions of King’s books this year. Their plan is to get the books out as close to the original publication dates as possible: Christine (with an introduction by Michael Marshall Smith) in late April and Pet Sematary (with an introduction by Ramsey Campbell) in mid-November. The books will have wraparound covers, two-page endpapers back and front (each one different) and full color wraparound artwork on a special slipcase plus six interior b&w illustrations. The artists will be signing the tip sheets and they’re hoping to include King’s signature as a facsimile. Print run should be 300-400 numbered copies. Sony Pictures announced recently that the Carrie remake has been pushed back from its March 15 release to October 18. The Facebook page Blumhouse Productions has released two behind the scenes photos for the movie Mercy, based on King’s short story “Gramma.” Dylan McDermott joined the cast recently, along with Frances O’Connor, Chandler Riggs and Joel Courtney. Peter Cornwell is directing. See more here.